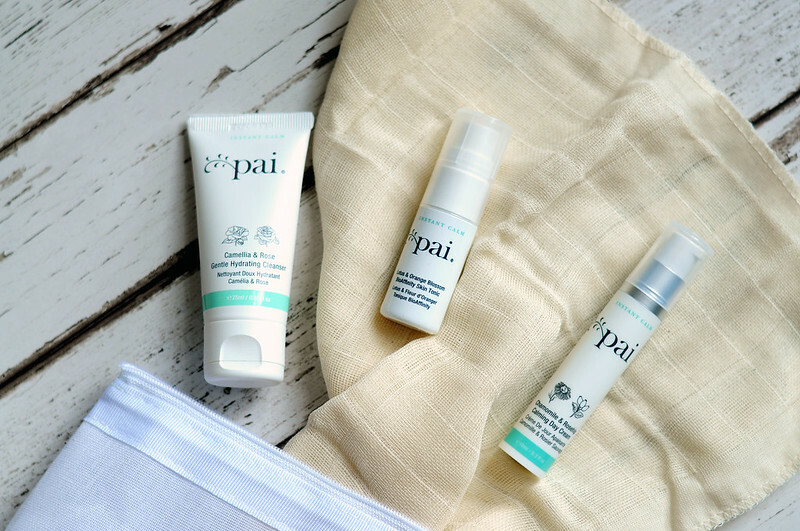 Pai has been a brand I've wanted to try for a while, especially the skin care, but it does work out quite expensive to buy the full-size cleanser, toner, serum and moisturiser. This is where the travel size comes in. They're bigger than sample sachets so you can actually get a decent amount of use from each one, but if you don't like them then you haven't spent as much money. Camellia & Rose Gentle Hydrating Cleanser | £28 for 100ml or £38 for 200ml // You get a muslin cloth in the set which is a really good size, but I prefer the texture and feel of the Liz Earle cloths I have and prefer to use. This has the typical cream cleanser consistency, but I use it and remove it like I would a balm. I apply this to make-up free dry skin and massage it over my skin for a couple of minutes. I then take a warm damp muslin cloth and gently remove the cleanser and then I splash my skin with cold water. I haven't even tried to remove make-up with this cleanser as I just don't think it would work and I prefer to use a micellar water anyway. It is the perfect skin cleanser though as it's full of great ingredients and my skin always looks and feels nice after I use it. It doesn't strip or dry my skin out, instead it leaves it feeling even more hydrated and moisturised. Lotus and Orange Blossom BioAffinity Tonic | £30 // Lets just talk about the packaging of this mini toner bottle as the spray works really well and once it's empty I'm going to keep hold of it and fill it up with another toner when I travel next. Not only does this toner help to keep skin hydrated, but it also works amazingly well at calming the skin down. No matter what I use, my skin always goes quite red when I cleanse my face and this toner really helps to soothe my skin afterwards. If you keep this in the fridge, it's the perfect thing to use when it's hot out. I tend to spray it into my hands and then pat it into my skin as I find myself wasting too much product when I just spray it directly onto my face. This is probably the only one out of the three that isn't so unique as I find these types of toners to work in pretty much the same way. I really like the REN Tonic Moisture Mist as well as the balance Me Skin Bright Hydrating Mist and this one from Pai is very similar. It is also more expensive which is something to think about. Chamomile & Rosehip Calming Day Cream | £34 // Despite trying and using what feels like a million and one moisturisers, I still haven't found one that I have fallen in love with and can see myself repurchasing and using for a long time. I think I have found a good contender with this moisturiser from Pai. It's still early days, but I have been very impressed with it. One pump is enough and it sinks in really well without much effort. My skin is always left feeling incredibly soft and smooth after I use it, but it never feels tacky or greasy which I've found with some moisturisers I've used in the past. It's moisturising enough for my dry patches, but isn't heavy for the areas of my face that are more oily which is amazing. Moisturiser is the one product that my skin reacts to the most and so far I haven't noticed any irritation. The list of ingredients is one that I can actually read and understand and my skin seems to like it. The Anywhere Essentials kits are £20 each and are available for most skin problems and skin types. They give you a chance to try out the products before buying the full sizes plus they're the perfect size for travel, especially the spray toner. Instant Calm, Perfect Balance, Pure Hydration or Age Confidence. I now want to properly try the serums from Pai as I've only had a sample sachet of one of them and it's not enough to really test it out. I also recommend the body products if you suffer from eczema and/or dry skin as they really helped. The two new-ish face masks are also on my to try list. I know I keep saying this, but I really REALLY need to try Pai products!